Barcode Bazar is India’s leading supplier of Pvc blank card for FARGO printers. All type of card accepted by FARGO printer is available with us like PVC Cards, Magnetic Strip cards, Pre printed cards, Proximity cards, Adhesive Cards, Smart chip cards, Mifare cards. FARGO Printer accepted thickness 30 mil of cards and Size 3.375" x 2.125" (85.6 mm x 54 mm).Forgo printer is commonly use to print Aadhar cards, Epic cards and ID cards. The FARGO DTC1000Me, DTC1250e, and DTC4250e Card Printers are capable of printing single feed cards and multiple feed cards (batch mode). Printing onto such poor quality cards may lead to poor print quality and can greatly reduce the life of the print head. Card types include PVC or PVC finish. Cards eject into the output hopper or reject hopper. Each input hopper holds 100 cards. Certain types of smart card chips are raised slightly above the cards surface, which may result in poor color transfer. Design the card with white space surrounding the chip. 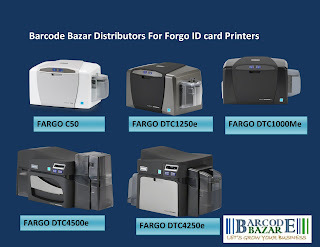 Barcode Bazar is authorized dealer of FARGO. We provide services and consumable for FARGO printer at reasonable price. We are supplier of FARGO printer and ribbons all over India. We always have a stock of FARGO ribbons with us like FARGO 45000 YMCKO (250 prints) and FARGO 45200 (500 prints).Refillable cartage color cartage: 45015 YMCKO (250 prints).One time useable dual Side printing color cartage 6 panel: FARGO 45010 (200 Images) .Half panel one time use: FARGO 45014 Half-Panel ribbon (350 Images) . Half panel refillable FARGO 45029 (350 Images). One time useable black cartage: FARGO 45102 (1000 Images). Black cartage refillable: FARGO 45117 (1000 prints). FARGO Direct-to-Card Printers require highly specialized supplies to function properly. The FARGO DTC1000Me, DTC1250e, and DTC4250e Card Printers use a one piece, disposable ribbon cartridge system. To maximize printer durability, reliability and printed card quality, you must use only FARGO certified supplies. For this reason, your FARGO warranty is void, where not prohibited by law, if you use non-FARGO certified supplies. Printer cleaning is recommended with each ribbon change to ensure quality printed cards. 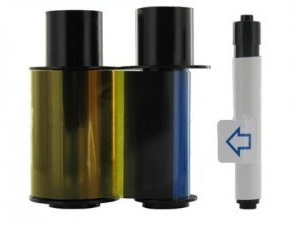 Resin-only print ribbons consist of a continuous roll of a single resin color. No protective overlay panel (O) is provided because resin images do not require the protection of an overlay. Ø Insert the print ribbon cartridge into the printer. Ø Close the front cover. 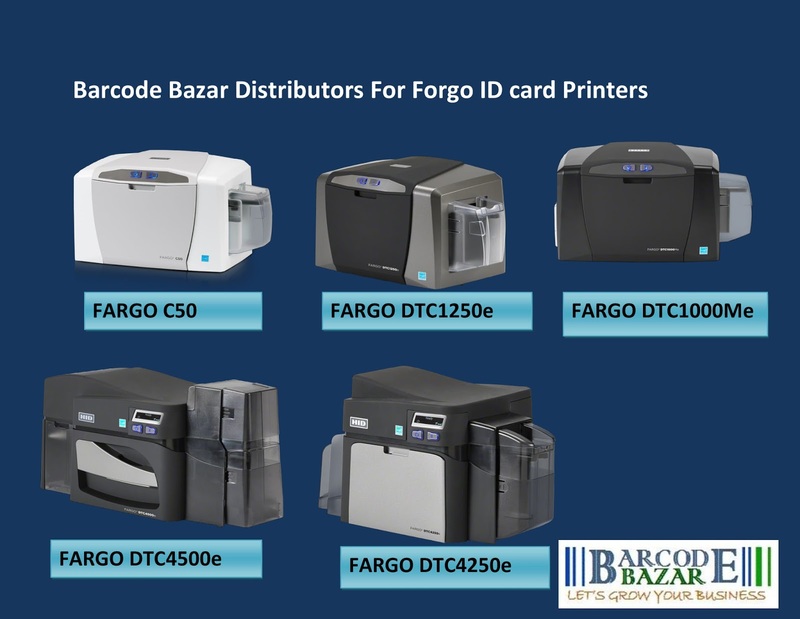 Barcode Bazar a distributor and supplier Evolis card printer. We provide solutions to your Evolis card printer requirements using our extensive knowledge of the printing, products range, consumables and services. Evolis card printer are available in many models : Evolis Badgy 100,Evolis Badgy 200 ,Evolis Primacy ,Evolis Zenius, Evolis Quantum and Evolis Securion. Evolis Card printer Ribbons for all the Evolis Card printer is always there in stock of Barcode Bazar. Barcode bazar is dealer and supplier of Forgo printers in India. Fargo’s name is synonymous with quality, reliability and performance - even more so now that Fargo has become an HID Global company. Fargo card printer comes in various models according to application and use. Fargo card printer is classified by single side printer dual side printer, quantities of card printing and limitation or non lamination printers, Encoder printer. Fagro present three basic models Fargo50, Fargo 1250e, Fargo DTC 1000Me these printer are ideal for small level business and low quantities printing. These printers don’t have encoder faction. Fargo50 and Fargo DTC 1000Me single side printer. Fargo50 is color printer and Fargo DTC 1000Me is black in white printer. Fargo 1250e is color dual side printer. Fagro offer medium quantities card printer series with and encoder models Fargo DTC 4500E and Fargo DTC4250e. Fargo DTC 4500E is a non-lamination featured printer and Fargo DTC4250e is lamination featured printer. Fargo DTC 4500E can print 225 card per hour. Fargo printer is always there in stock of Barcode Bazar. Barcode bazar are leading Evolis printer seller in India by providing Evolis printers, consumables and services. We presenting reasonable Evolis printing solution For employee card, membership card, event badges, students cards ,gift and offer cards . Evolis deign special for rage people who need to print a few hundred plastic cards per year. There is three model in this rage Evolis Badgy 100, Evolis Badgy 200 and Evolis Zenius. 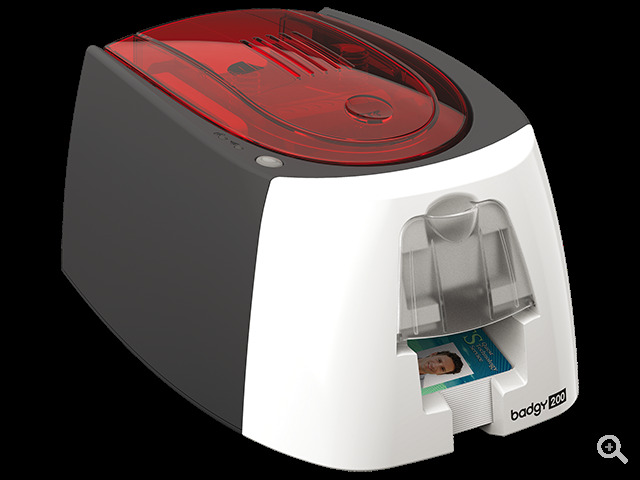 Badgy by Evolis—An inexpensive card printer that includes everything you need to produce simple plastic cards and badges – all in one box. Evolis Badgy 100 is come with 50 blank white PVC cards and A color ribbon with a 50-print capacity and Evolis Badge Studio software. Evolis Badgy 200 come with 100 blank white PVC cards and A color ribbon with a 100-print capacity and The Plus version of the card creation software. Evolis Badgy 200 is Edge-to-edge printing feature on other hand Evolis Badgy 100 is Printing close to edge with a margin of 1,35mm. Evolis Zenius—Eco-friendly, low-volume Evolis printer that replaced the Evolis Tattoo and produces high-end print quality Zenius makes it easy for you every step of the way! Discover a wealth of advanced features loaded in a contemporary yet compact design. Zenius can be accommodated in virtually any environment, be it a welcome desk, a sales counter, or an office desk. By its really low weight, Zenius is the lightest printer in its category. 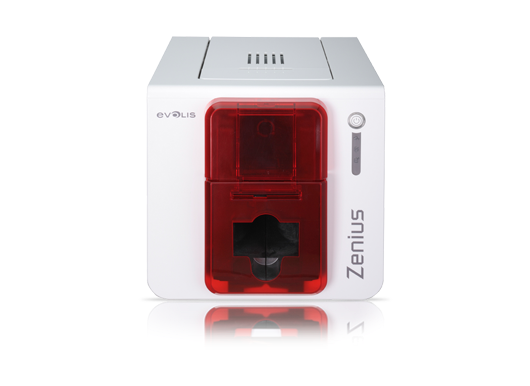 Evolis Zenius have 50 card feeder space . Evolis Badgy have 25 card feeder space . Evolis Zenius can print 10 mil to 30 mil thick cards. Evolis Badgy can print 0.50 to 0.76 mm thick card. Barcode bazaar is India’s leading card printer selling company and service provider. We are distributors for the Fargo Aadhar card Printers. We are offering complete card printing solution which include Forgo card Printer, Ribbon, Aadhar pre printed Cards, software and services. There is many kind of cartage for this printer according to use, printing images, and panels. One time useable Single Side printing Five Panel color cartage: Fargo 45000 YMCKO (250 prints) and Fargo 45200 (500 prints).Refillable cartage color cartage: 45015 YMCKO (250 prints).One time useable dual Side printing color cartage 6 panel: FARGO 45010 (200 Images) .Half panel one time use: Fargo 45014 Half-Panel ribbon (350 Images) . Half panel refillable Fargo 45029 (350 Images). One time useable black cartage: FARGO 45102 (1000 Images). Black cartage refillable: FARGO 45117 (1000 prints). All of these ribbons is for use with Fargo DTC 1250 And DTC1000. All types of Ribbon for all the Forgo card Printer is always there in stock of Barcode Bazar. 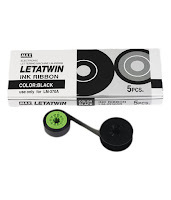 We Barcode Bazar are one of the renowned in the ferrule printing Industry, we are distributors for the letatwin ferrule printing machines and Consumables . Letawin Max is the Japan make ferrule printing machine used for the printing Letatwin pvc tubes and Letatwin PVC Tapes. Letatwin Max Machines are available in two different model. One is Letatwin LM-390A ferrule printer which comes with the PC Connectivity feature i.e. high end machine. Other one is the basic model Letatwin LM-380E, that is the manual ferrule printing machine which comes with the USB feature. 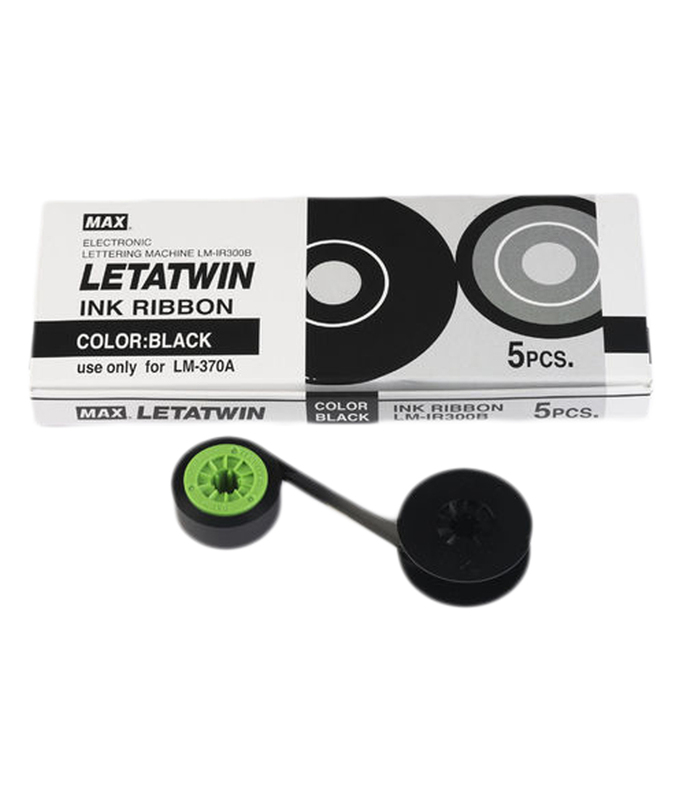 Letatwin ink Ribbons are same for letatwin LM390A, Letatwin Lm380E, Letatwin LM-380A, Letatwin 370A and the part no for the same is LM-IR300B. This versatile photo ID card system is a reliable and affordable solution for organizations looking to print secure, dual-sided ID cards for their employees, customers, or volunteers. 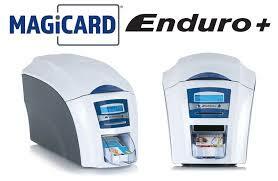 A powerful and flexible dual-sided ID card printer, the Magicard Enduro+ Duo produces durable, full-color cards suitable for student and employee ID programs, loyalty and membership clubs, gift card programs, and more. The Enduro+ Duo prints both card sides in a single pass, saving time while expanding the design area of your cards so you can include a range of elements from photos and graphics to signatures, barcodes and additional security items. Single/Double-sided The Enduro+ is a single-sided printer which can be easily field upgraded to double-sided by means of a simple drop-in upgrade kit. The Enduro+ Duo is pre-configured as a double-sided printer. 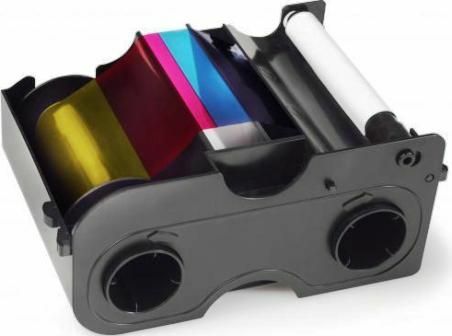 Print mode Colour dye sublimation and monochrome thermal transfer and rewritable technology. Visual security The user has the option to print a transparent HoloKote security watermark over the printed card image. When used with HoloPatch cards, one area of the HoloKote watermark is highlighted for distance visibility. A choice of 4 fixed HoloKote patterns are selectable from the printer driver. Print speed Colour (YMCKO): 35 seconds each side, monochrome: 7 seconds. Warranty Two years limited depot warranty. Printer interfaces USB rev1.1 (USB 2.0 compatible), Ethernet upgrade option. Card Capacity 100-card feeder, 30-card stacker. Printer size Height: 233 mm (9.2") Length: 453 mm (17.8") Width: 206 mm (8.1"). Card capacity 100 cards feed hopper, 30 cards output stacker. Card types CR80 and CR79 ISO PVC blank, HiCo magnetic stripe, smart cards, self-adhesive, rewritable and HoloPatch cards. Card dimensions ISO standard CR80 85.6mm x 54mm or 3.375" x 2.125", and CR79 83.9mm x 51mm or 3.303" x 2.051". Power Source External power supply 100-240V 50-60Hz autoranging. Printer weight 5.5kg (12 lbs).